All designs, texts & paintings presented within this site are by Jacques Benoit, and are under the author’s copyright, (except when derived from other sources and then mentioned as such). Merci à Kate Bush, Miles Davis, Alfred Hitchcock, Shirley Horn, Elton John, Rickie Lee Jones, Stanley Kubrick, Pat Metheny, Joni Mitchell, Oscar Niemeyer, Véronique Sanson, Patti Smith, et tous ces créateurs dont la personnalité, le parcours exemplaire et l'œuvre artistique m'ont inspiré, ébloui et si souvent guidé sur mon chemin de peintre. Thank you to Kate Bush, Miles Davis, Alfred Hitchcock, Shirley Horn, Elton John, Rickie Lee Jones, Stanley Kubrick, Pat Metheny, Joni Mitchell, Oscar Niemeyer, Véronique Sanson, Patti Smith, and all these artists whose personality, exemplary path and outstanding artistic work have inspired me, dazzled me, and have so often guided me on my painter's way. Obrigado a Kate Bush, Miles Davis, Alfred Hitchcock, Shirley Horn, Elton John, Rickie Lee Jones, Stanley Kubrick, Pat Metheny, Joni Mitchell, Oscar Niemeyer, Véronique Sanson, Patti Smith, e todos esses artistas cujas personalidades exemplares e extraordinário trabalho artístico têm me inspirado, surpreendido e, tantas vezes, me guiado nesta minha estrada como pintor. Ce site présente les peintures, les gravures, les collages et les œuvres sur papier du peintre français Jacques Benoit. 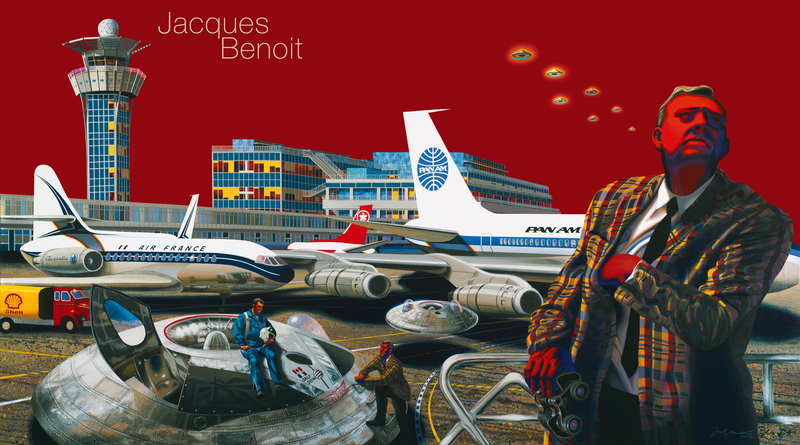 This site is showing the French painter Jacques Benoit's paintings, engravings, collage and works on paper.